Lekota drops Parly bombshell on Ramaphosa - SABC News - Breaking news, special reports, world, business, sport coverage of all South African current events. Africa's news leader. COPE Leader Mosiuoa Lekota’s speech was preceded by a back-and-forth argument between him and NCOP Chairperson, Thandi Modise. COPE Leader Mosioua Lekota has brought the National Assembly to complete quiet, followed but murmurs of startle when he accused President Cyril Ramaphosa of selling him and other comrades out to the apartheid special branch. 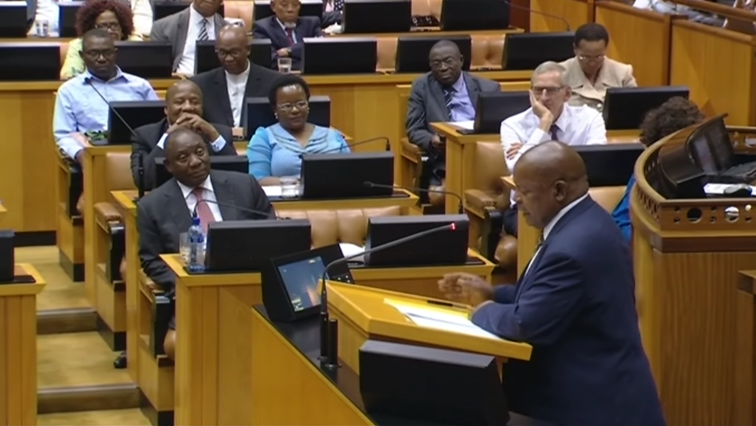 On the second day of the debate on the State of the Nation Address (delivered by Ramaphosa last Thursday), Lekota’s speech was preceded by a back-and-forth argument between him and National Council of Provinces (NCOP) Chairperson, Thandi Modise. This, when Lekota refused to address the house in Ramaphosa’s absence. Ramapahosa, who later assumed his seat, had apparently stepped out of the house just before Lekota took to the podium. Later, when Ramaphosa had assumed his seat again, Lekota continued with his response, first recalling what he says was a trip they were invited on by the late Black Consciousness Movement leader, Steve Biko. Malema said the President’s fear of white people would prevent black people from succeeding. This entry was posted on 13 Feb 2019,06:34PM at 6:34 PM and is filed under SONA, Politics, Homepage Featured Story Slider. You can follow any responses to this entry through the RSS 2.0 feed. Both comments and pings are currently closed.